A few weeks ago, I brought home 7 boxes of antique books from the auction house. 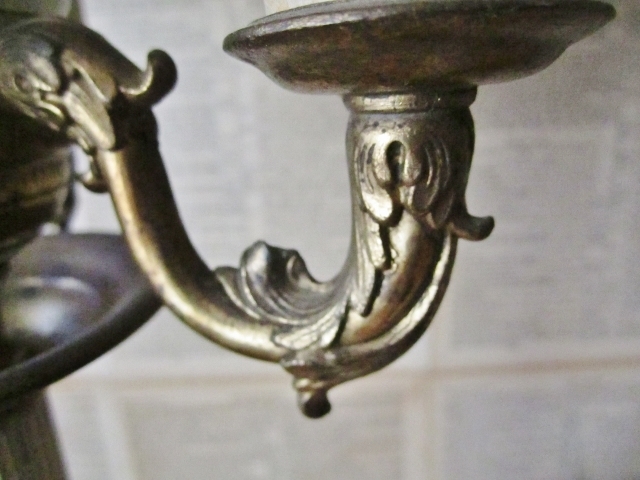 Many of them are from the 1800’s and quite a few were falling apart. Such was the case with a Bible in the box. 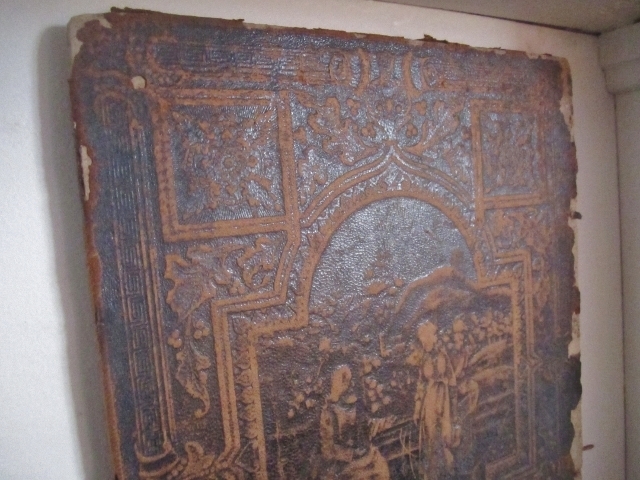 Both covers were completely detached and the pages were becoming unbound. I’m so glad whoever owned it didn’t just trash it. my shelves I showed you last week here. You know where I’m going with this don’t you??? 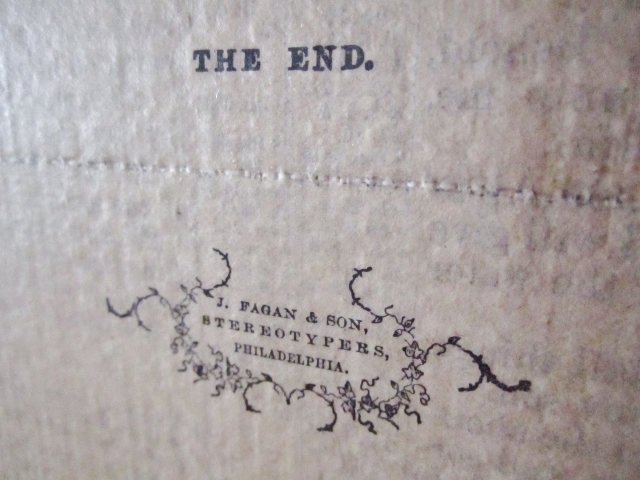 I’m dangerously close to becoming addicted to using pages from vintage and antique books as wallpaper. 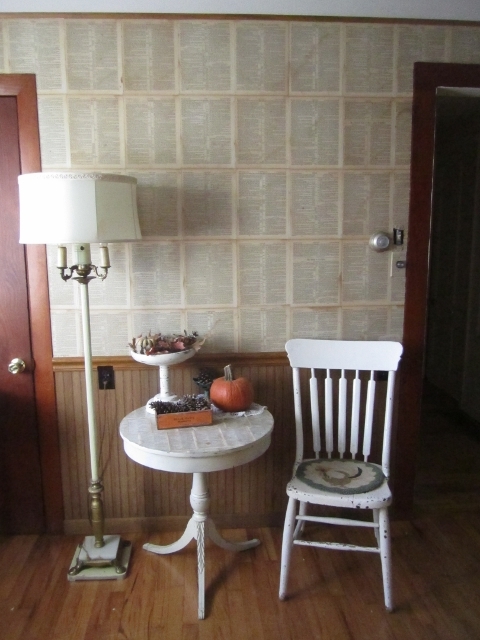 I loved covering the paneling in my entryway with vintage dictionary pages and the walls in my living room need equal attention. I plan to paint 2 of the walls, but wanted one “focus” wall. Different people have different feelings about repurposing Bible pages, but my feeling is that if I can keep an otherwise “trashed” Bible out of the trash, in a way that honors it…it’s a good thing. Here is the wall before. While the wallpaper wasn’t hideous looking, the seams in between the wallpaper segments were coming loose and looked tacky. 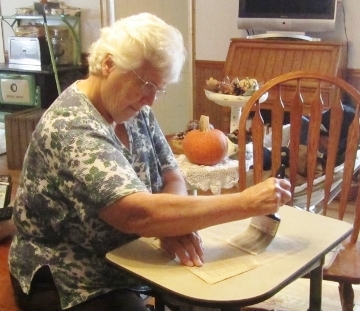 My mom is here visiting, so I put her to work “painting” the pages with glue while I adhered them to the wall. 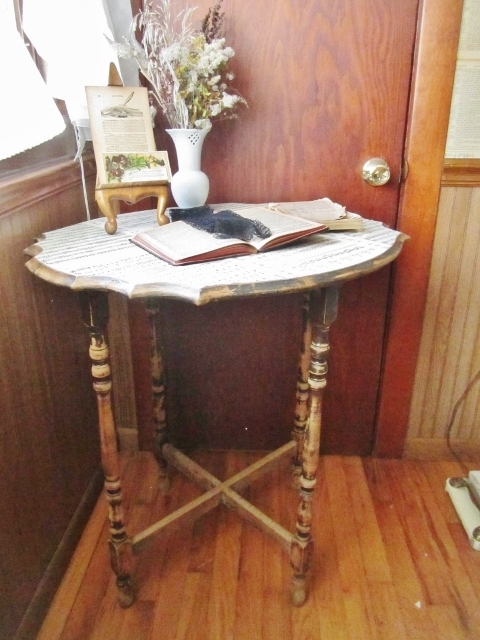 I won’t bore you with the step-by-step process, since you saw it before on my dictionary papered entryway, so here’s the finished result. 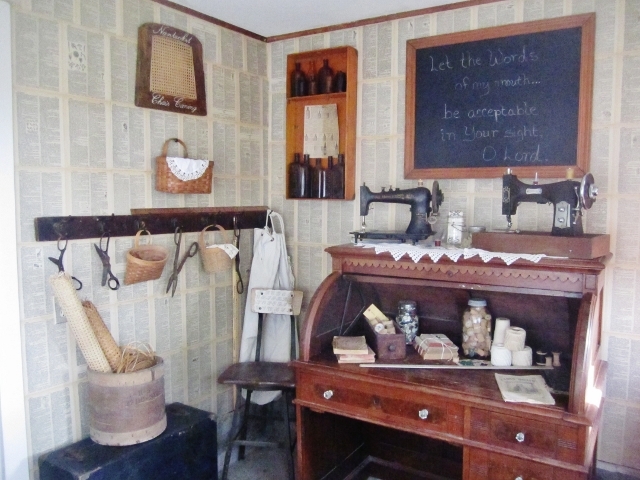 The wall has such a warm “glow” now with these 111 year-old pages. 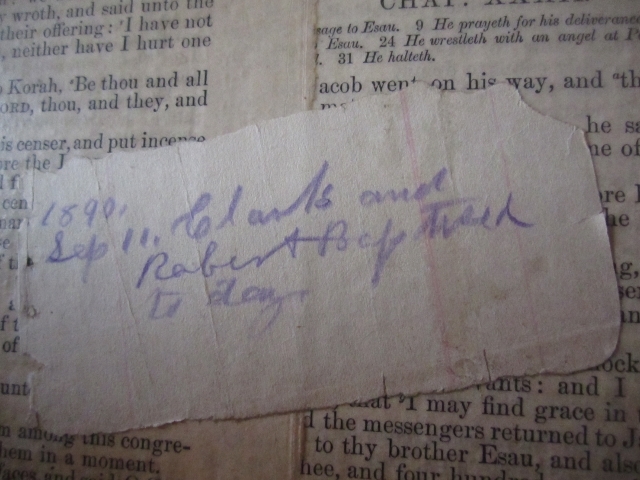 As if these pages aren’t treasure enough, inside the Bible was this little scrap of paper with the date 2 people were baptized. That scrap has been with those pages for 111 years, so I wasn’t about to separate them. It’s someone’s history. I added the scrap to the bottom edge of the wall. 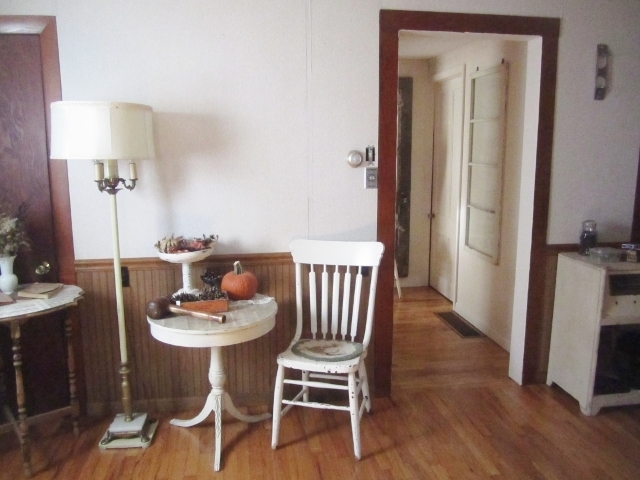 I’m going to really enjoy changing the decor by the wall, but here are some glimpses of how I’ve got it decorated now. I got this extremely old table at an auction . I love the time-worn finish it wears. I added vintage sheet music to the top. 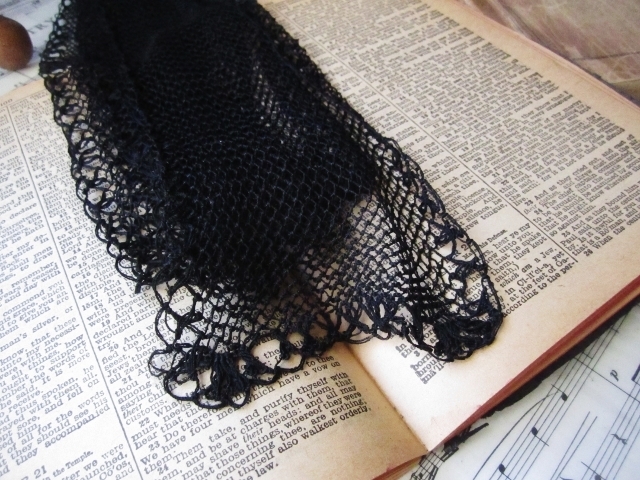 On the table sits an antique New Testament, with beautifully aged pages and my grandmother’s headcovering that she wore to church rests on it. 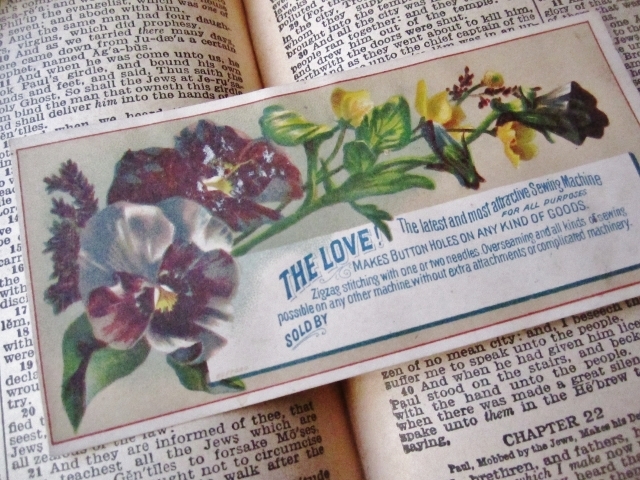 This card was inside the Bible and was an advertisement for a sewing machine. 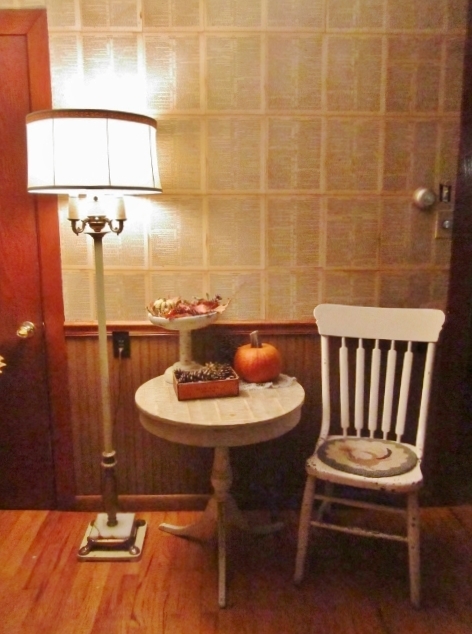 The other table along the wall is the very first table I put antique pages on last year. 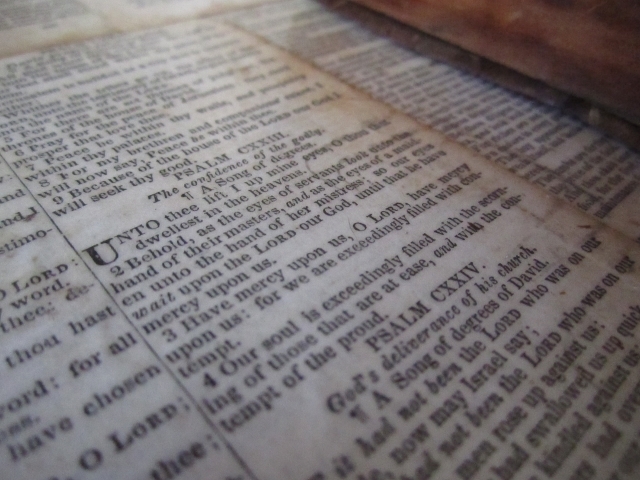 It has smaller pages that are came from a tattered Bible. 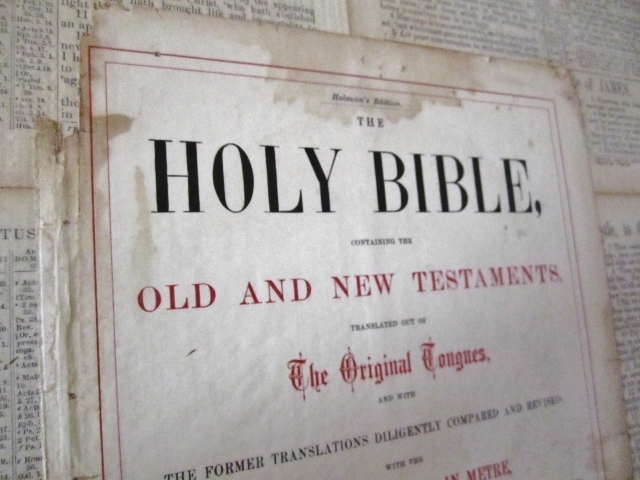 On the spine of the Bible was written, “Mother’s Bible”. I don’t know who the mother was, but I hope she would like this table featuring the remnants of her dear little Bible. I love the pedestal base and claw feet on this drum table. 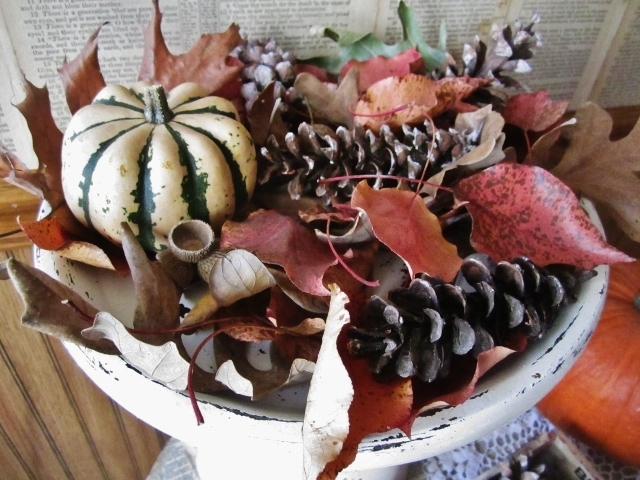 I choose lots of Fall colors to dress up the table. My son collected the pine cones, acorns and leaves for me. 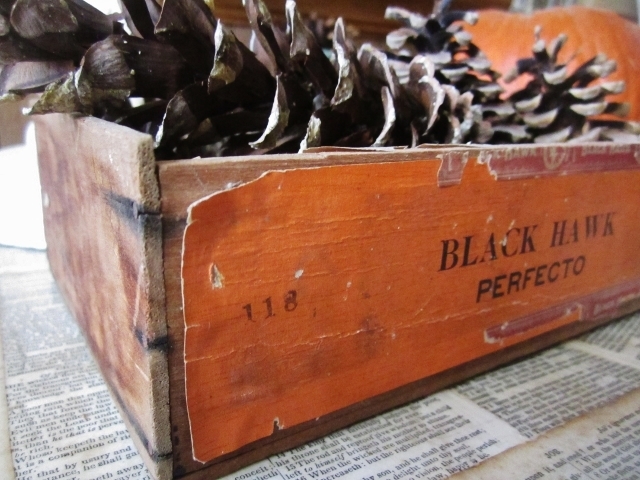 Both the wood and the tattered orange label on this old cigar box are perfect for holding more pinecones. 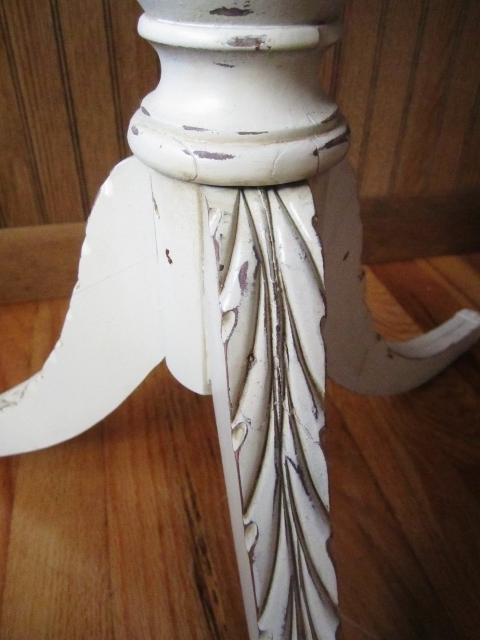 The lovely old floor lamp was a bargain from an auction. It has such pretty details. 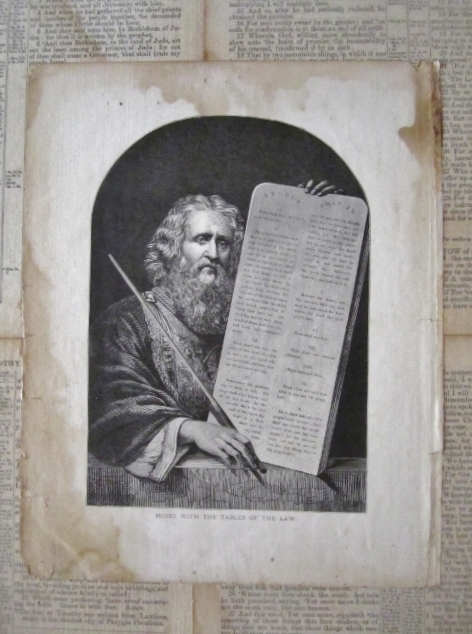 There’s a small segment of the wall in between the hallway and a closet door, so I added the cover page of the Bible and an illustration of Moses with the 10 Commandments there. Total cost for this project? $0, Nada, Zip, Zilch! I sold a lot of the intact books that came with the Bible, so the Bible was a leftover. I had lots of glue leftover from the dictionary wall, so I didn’t have to buy any more! glad I can make this old Bible a visible feature in my home. Love what you have done with your walls.Would love to try it if/whe/if we get to own a house again. Angie, I LOVE the idea of having The Word on the walls of your home. I’ve seen plenty of sheet music wall paper, but having the words of the Bible speaking to you… now THATS cool! I agree with Laurel; I’m sure there’ll be lots of times when things you’ve read a million times suddenly come into focus like someone is holding a light on one particular area. I just ripped open the box of sheet music I ordered off your Etsy shop. Angie, your sheets have so much more Character than the ones I’ve been finding around here! I cant wait to get started! Thanx again and congratulations on your feature on Funky Junk! Donna is the most creative, multi-talented person ever and I was so excited when I saw she featured your Harvest Banner Saturday Night! Gorgeous!!! You are inspiring me to use my vintage sheet music…. Oh my goodness Angie, you never fail to impress me. A perfect idea in a perfect space. The wallpapering is such a neat idea! I never would have thought of that. I love old books. I love imagining the readers who have treasured them before me. I love the idea of using that old cherished Bible in such a loving way. It looks amazing, how ever did you get it so perfectly straight? Just gorgeous! This is really charming, Angie! I’ll bet the glow from the old papers is wonderful! I love how your mother and you worked on it together! Oh, now I know what I’m going to do with a room in our new home!!! VERY COOL!!!! My hubby is a preacher and HE LOVED IT!!! We love it! Great job, and I’m so glad you joined me again for Pearls and Lace Thursday! What a labor of love. I really like how you incorporated the baptism note and kept it with the Bible pages. Very clever! I love your wall decorated with the pages -How cool you left the handwritten dates of the baptism intact with the Bible. -It was nice seeing your mom there helping you to create great memories in your home. I’m right there with you on the re-purposing otherwise trashed Bibles. They will be seen and read. Who knows if a life might be touched by these now or in the future? You go, girl! Angie, Great idea and your wall looks wonderful! The leather book covers are beautiful and I am glad you have them displayed. Thanks for sharing this project at the Open House Party and Happy Thanksgiving. Amazing idea! Your wall looks beautiful! Thanks for sharing. Wow those walls are amazing. Great job. Thank you so much for linking up to last weeks show and share. Make sure to come back and link up this week with your latest project. I love the look, I want to do this above my mantel but the hubs won’t let me. UGH! But you gave me the idea I’ve been looking for, I bought a very old round table, and the top is a mess. so now I will be putting old pages on top. Wishing a happy Thanksgiving. Thanks so much for sharing over at Sunday’s Best. Wow! I love all the beautiful pages of words, and I’m sure you’ll find yourself staring at different pages all the time. A labor of love, and so nice that your mom was there to help! Wow. Amazing!! I’ve been talking to the kids a lot about spiritual warfare and how we need to be equipped with our Sword and that we need Scripture on the walls in our house. 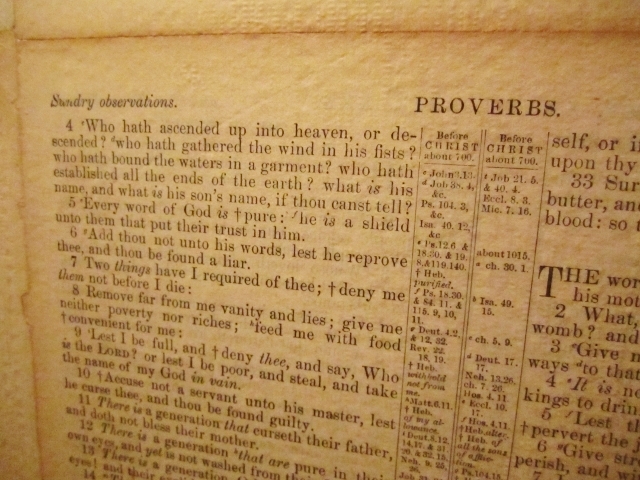 I never thought of this concept of using actual sheets from older Bible and literally covering the walls with Scripture. Amazing. Thanks so much for posting this! I’m a new follower! I love this! I have a barrister’s case full of old Bibles. My grandfather was a minister, and I inherited his entire collection of study books as well. What a wonderful way to display Go’d”s word!